Archaeology at the bottom of the sea: Mission Atlantis, our latest online slot from Oryx Gaming, pulls you into the fathomless depths of the ocean. Join the team of the discovery ship Eureka on their search for the legendary sunken city. Maybe you’ll even manage to recover the amazing treasures of this atmospheric casino slot game! What do you think of when the topic of the fabled, perhaps forever lost, city of Atlantis comes up? For most people, a picture of antique objets d’art, immeasurable riches and modern exploration technology comes to mind. 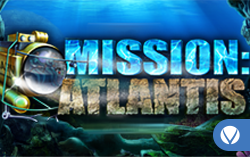 And you will find it all on the 5 reels and 25 paylines of our online slot game Mission Atlantis. The research team takes off in the submarine ‘Marv’ to explore the blue-green depths of the Atlantic for the remains of the lost city and bring its treasures to the surface. You are sure to quickly find success – golden coins, statues and ruins half-buried in the ocean’s floor rotate on the reels to the typically exciting sounds of an expedition movie. The only question is whether they will bring you online casino winnings by lining up from left to right and set the slots a jingling... Elements of modern discovery ensure lucrative casino gambling amongst the remnants of past grandeur. When the wild symbol – Marv – glides over the reels of this online slot, it serves as a joker and substitutes every symbol except the Eureka, the research vessel and scatter in the game. No marine quest would be possible without a radar scanner, and the dim green screen also serves as a bonus symbol to help you uncover the odd valuable surprise! If the submarine and wild symbol Marv surfaces 5 times on an active payline, you can hit the jackpot by winning 7500 coins – and even more if you are in the middle of a free spin round! There aren’t many tricks for winning when it comes to online slot gambling, but one of them is to make use of all of the paylines. Mission Atlantis is no exception: You are better to make a smaller line bet and bet on all of the paylines than make a large bet on only one. In addition to its joker function for all of the standard symbols, Marv sometimes surfaces between two radar scanners as a placeholder and opens up even more chances to win. If, at the end of a spin, the mother ship lays anchor three, four or five times on the reels, a bonus feature with 10 free spins is activated. During the free spin round, every win is multiplied by three, and it’s possible to win even more at the online casino – another fleet of Eurekas could turn up at any time and trigger yet another bonus round of free spins. But the real breakthrough for the treasure hunters on the Mission Atlantis online slot game happens when a collection of radar scanners turn up on the reels. No matter where three or more of these bonus symbols appear, they light the way to a trove of valuable artefacts that bring you great cash winnings at our online casino. You even have two chances to try for the most valuable artefact! Hunter or gatherer – which of your character traits surface when you play the online slots? The gamble feature makes it possible for you to double your winnings, but it also might lead to losing them completely. The online gambling feature is deactivated when you select auto-spin mode, in which you can set this online slot for a round of up to 500 continuous spins. Before you break off to Mission Atlantis, we just have one more tip for you: Play online slots for free in fun mode first, and acquaint yourself with the features of this exciting expedition into the deep before you start recovering the antique treasures and gamble for real money at our legal online casino!